Protect your gimbal lens and enhance the photos it takes with this Studio Series 7-Piece Filter Kit for DJI Phantom 3 Drones from Ultimaxx. 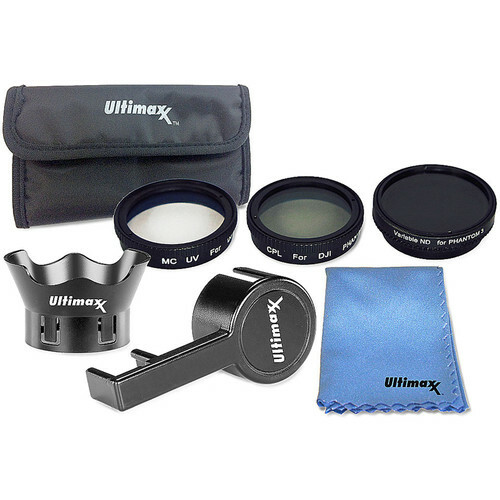 This filter kit includes three filters: UV, CPL, and variable ND2-ND400. When attached to your Phantom 3 gimbal's lens, they can help filter and reduce light from entering the lens, giving you the ability to adjust the look and quality of your photos in a variety of daylight conditions. All of the filters feature a digital multi-coating to help provide a layer of protection to the optics. Additional items in this kit include a rose petal lens hood, a lens cap/gimbal stabilizer, a microfiber cleaning cloth, and a four-pocket filter case. The lens hood helps to prevent glare, while the cap protects the lens and keeps the gimbal from moving when not in use. The included accessories are compatible with all DJI Phantom 3 drones, including the Phantom 3 Standard, Advanced, Professional, and 4K. As its name implies, a UV filter protects the camera's components by filtering out damaging ultraviolet light. It also adds a physical layer of protection for your gimbal's camera lens. The ND or neutral density filter is designed to give you the ability to manually manage exposure by reducing the amount of light that enters the camera lens. Traditionally, you would swap between multiple ND filters, but with this single filter, you can twist it and dial in the exact light restriction you need. With its ability to go from an ND2 to an ND400, you can jump from reducing light by a single stop, from 1 all the way up to nearly 9 stops. This adjustment ability allows you to shoot in wider f-stops under bright lighting conditions. The CPL or circular polarizer filter is mainly designed to reduce scattered light and the appearance of reflections in your images. It also can enhance color and increase the contrast of your footage.